The third and final Willie to get his just due on a final Topps cards is here. It is none other than the great Willie McCovey. Willie broke into The Show back in 1959, and went 4 for 4 against fellow Hall of Famer, Robin Roberts, in his debut. Amazingly, Willie won the ROY in '59 while only playing in 52 games. Willie Mac continued to be an amazing power hitting 1B for the Giants and made a great tandem with Willie Mays. For a two year stretch from '64 to '65, McCovey was part of a little unknown historical fact. Those Giants were one of 3 teams to field five BBWAA HOFers at the same time. Those Giants teams included: Mays, McCovey, Marichal, Gaylord Perry and Duke Snider (64) / Warren Spahn (65). If you throw in Orlando "Baby Bull" Cepeda from the Veterans Committee, that makes six hall of famers on one field for one team. Awesome. 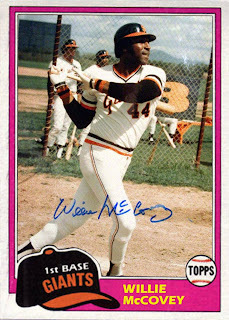 McCovey went on to hit 521 home runs and is tied with Frank Thomas and Ted Williams. McCovey also had a two and half season stop over in San Diego (yay!) and a brief stint with the Oakland A's. Willie also wore number 44 in honor of Hank Aaron, who is a fellow Mobile native. Awesome. Even for a Giant.